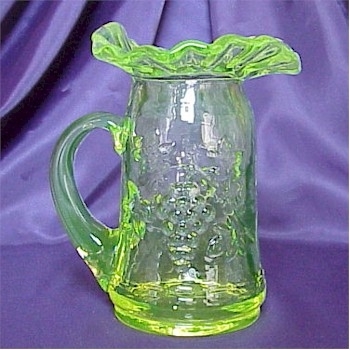 Grape Vine Ruffled Pitcher in Vaseline Opal, Bargain Shack offers Boyd Glass, Mosser Glass, L.G. Wright, and Contemporary Collectible Glass including Vaseline Glass - J.B. Scottie Dogs, Pooche, Animal Covered Nests, Toothpick Holders, Salts, Glass Animal Figurines, Clowns, Dolls, Slippers, Vehicles, and More! This Grape Vine Ruffled Pitcher is so pretty in Vaseline Opal! This pitcher is just lightly dusted with opalescence. The raised grape and leaf pattern is simply beautiful and the ruffled top is formed into a pour spout! This pitcher stands 5-1/2 inches tall and the bottom is stamped Gibson 2000.